Welcome to part 12 of our tutorial on building a website with Drupal 6. Previously we covered: Part 1: Introduction Part 2: Installing Drupal 6 Part 3: Configuring your Site Part 4: Playing with Blocks Part 5: Playing with Modules Part 6: Playing with Themes Part 7: Installing Modules and Themes Part 8: Pathauto, Content, and Content Types Part 9: Users, Roles, and Permissions Part 1o: Reports - Keeping Track Part 11: Managing Spam and Comments As we go through this tutorials I am building a Drupal resource site called Learn Drupal. So far our website is shaping up really well, the basics are pretty much taken care of, and we're now looking to build on content, and start adding on more functionality, depending on the purpose of your website. In this installment, we're going to look at how to make formatting your content easier for yourself and your users. 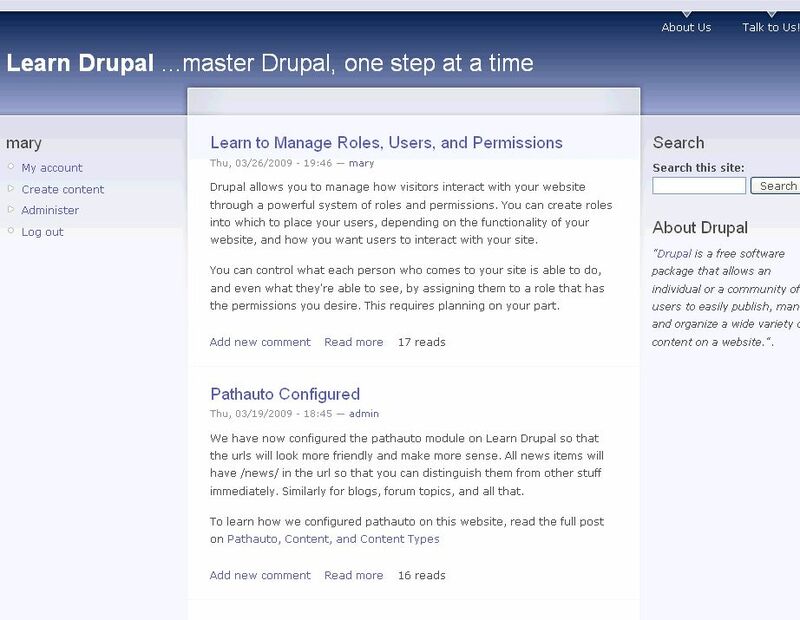 Welcome to part 11 of our tutorial on building a website with Drupal 6. Previously we covered: Part 1: Introduction Part 2: Installing Drupal 6 Part 3: Configuring your Site Part 4: Playing with Blocks Part 5: Playing with Modules Part 6: Playing with Themes Part 7: Installing Modules and Themes Part 8: Pathauto, Content, and Content Types Part 9: Users, Roles, and Permissions Part 1o: Reports - Keeping Track As we go through this tutorials I am building a Drupal resource site called Learn Drupal. So far our website looks like this: (you can click on the images for a larger view) As we've been building our website we've been aiming to have users and visitors interact with our website. One of the ways in which visitors interact with the Learn Drupal website is by leaving comments, and sometimes, spam. Today, we're going to look at some ways of managing comments and spam on our website. 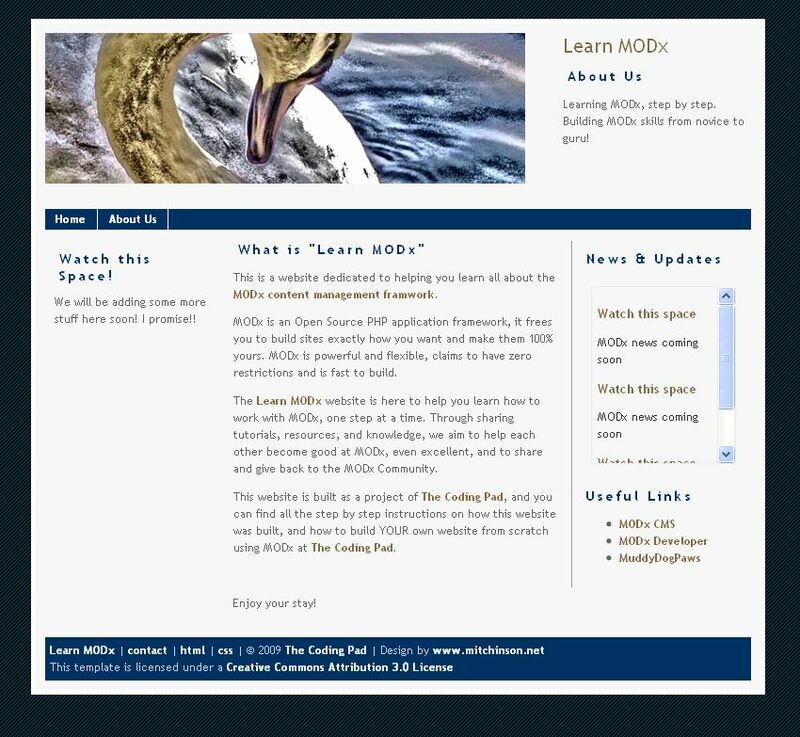 Welcome to part 5 of our series of tutorials on building a website with MODx CMS. 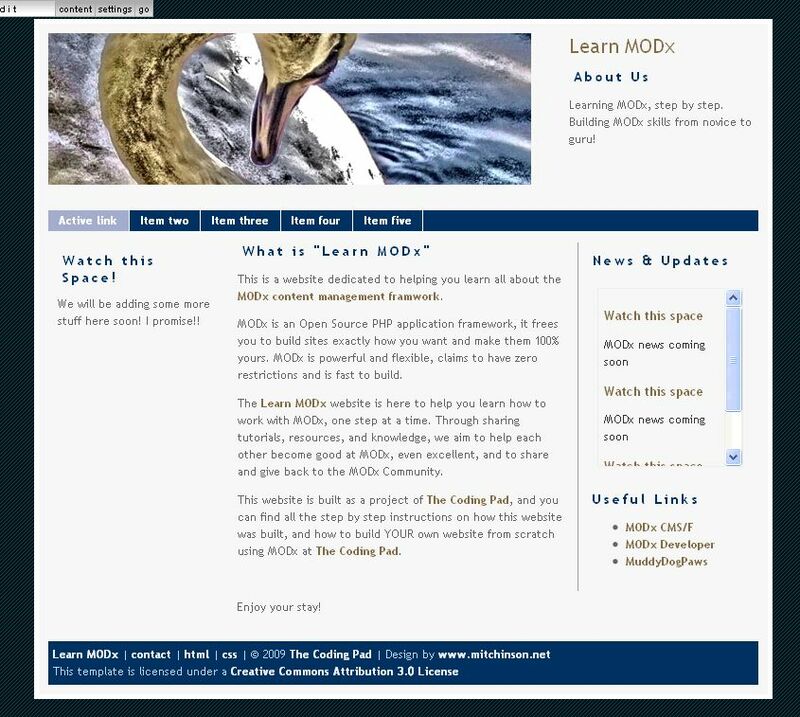 So far we've looked at: Part 1: Introduction to MODx Part 2: Installing MODx Part 3: Working with Templates Part 4: Introducing Chunks As we work through these tutorials, we're building a MODx resource site called Learn MODx. In the last installment we introduced chunks and learned how to use them to clean our template and make it more manageable. So far our website looks like this: (you can click on the images to see a larger view) Today, we're going to introduce snippets and learn how to use them to add functionality to our website using one simple example. At this point in our tutorial, if you've been following along, our website navigation is simply cosmetic and the links don't really lead anywhere. We're going to use a snippet to rectify that and make our site navigable from the horizontal menu links. 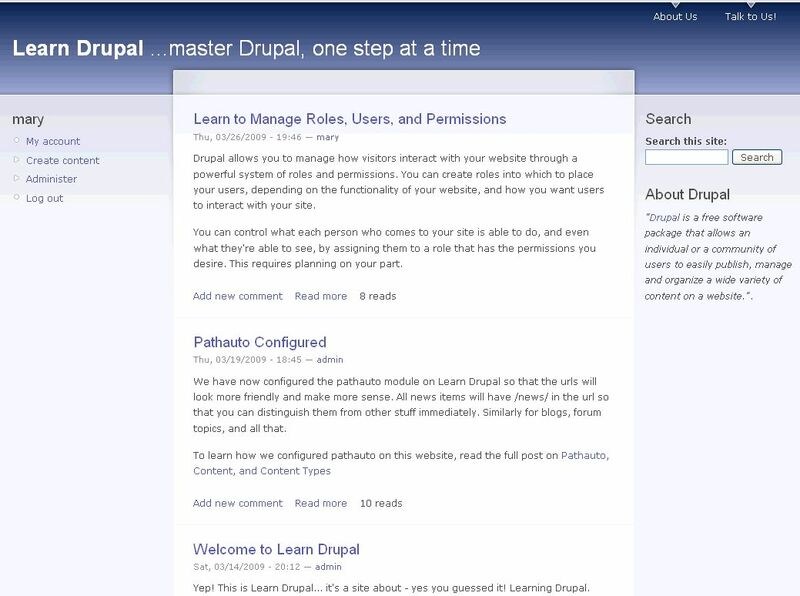 Welcome to part 10 of our tutorial on building a website with Drupal 6. Previously we covered: Part 1: Introduction Part 2: Installing Drupal 6 Part 3: Configuring your Site Part 4: Playing with Blocks Part 5: Playing with Modules Part 6: Playing with Themes Part 7: Installing Modules and Themes Part 8: Pathauto, Content, and Content Types Part 9: Users, Roles, and Permissions As we go through this tutorials I am building a Drupal resource site called Learn Drupal. So far our website looks something like this: (you can click on the images for a larger view) Our website is coming along great, we have some content, we have a contact form, we have a relatively unique look, things are looking good. But how do we know if we're getting visitors? You'll notice in my screenshot that I have a counter on each piece of content that tells me how many times the content has been viewed. This is made possible by the settings we chose when we enabled the Statistics module, and is visible to me as the administrator, and you should be able to see it on your website too. But what other specific data does the Statistics module log? This is part of what we're going to briefly explore today.